Sonoma State University's annual Juried Student Exhibition opens in the University Art Gallery with a free public reception Wednesday, March 30, 5-7 p.m. and will be on view through Sunday, April 24. The exhibition features more than 40 artworks in a variety of media, including painting, sculpture, photography, printmaking, drawing and mixed media, which reflects courses offered in the art studio program at Sonoma State as well as the students' own individual creativity. The work in the exhibition is selected by two jurors from the professional art world who visit the campus to view the work and talk to the students about their careers and ideas about art. 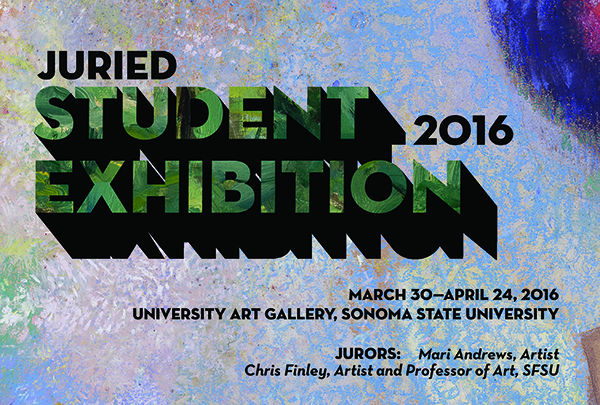 This year the jurors are artist Mari Andrews and artist and San Francisco State art professor Chris Finley. The University Art Gallery is open Tuesday-Friday, 11 a.m.-4 p.m., and Saturday and Sunday, noon to 4 p.m. Admission is free, parking is $5-$8 on campus.